Senator Pan is challenged to a debate. Bill’s consequence of practicing medical freedom is forfeiting Educational Rights. On June 9, 2015, Senate Bill 277 passed through the Assembly’s Health Committee and is perilously close to becoming law. With this bill, Californians will have to choose between maintaining their parental rights to make decisions over their children or their children’s right to equal education and childcare services. Assemblyman Rocky Chavez has called out Senator Richard Pan to debate the countless legal and ethical issues that have gone unvetted in the press thus far. “There is no compelling state interest to eliminate a personal belief exemption, especially given that it is being used by such a small percentage of the population,” says attorney George Fatheree III, practicing Education Law. 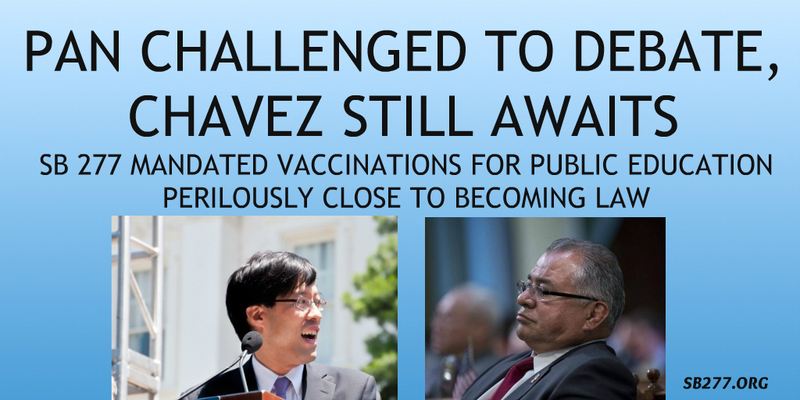 Doctor Jay Gordon, MD FAAP states, “SB277 is not about whether vaccines are right or wrong, I want to make that very clear.” Assemblyman Rocky Chavez spoke out about the bill at a rally on 6/12/15, “This isn’t an issue of vaccines, this is an issue of freedom...This spreads out to the rights of the individual and limited role of government…I am challenging Doctor Pan to a debate on SB277”. Call your legislators today! Go to sb277.org to find out more about the bill and use the site to contact your legislators and the governor. Summary: SB 277 mandates full vaccine schedule for ALL children daycare through high school. This bill removes exemptions for religious/philosophical beliefs that allow parents to customize vaccine schedules for their individual child's needs. This bill will deny daycare, preschool and public/private school education to children who don't meet these strict guidelines. It’s critical that our political leaders understand the diversity in family medical history and susceptibility to adverse reactions and that our children are not all the same.